Ser Mountain Goat is my online nickname on westeros.org (the George RR Martin fan forum) and this website features the projects I have undertaken as a fan of Game of Thrones. This includes the creation of a speculative world map artwork (created in Fireworks) and a huge ongoing project (originally begun in Flash but will migrate to HTML5) to track the characters and events of A Song of Ice and Fire in a day by day animated timeline map. I've been a fan of George RR Martin's A Song of Ice and Fire books since around 2000. At that time only three books had been published and I went online to search for news on when the fourth book would be out (it could not be long I thought!) and found the fan forum of westeros.org. I signed up and joined many discussions about fan theories and made a lot of life-long friends in the process. In early 2010 a discussion about narrative charts resulted in a post from one forum user who said it would be awesome to have some kind of animated map where the characters are marked as dots and we could see the paths of their journeys animate across the map. Unfortunately he did not have the skills for it, but I thought perhaps that I did. I had originally intended to use a timeline spreadsheet that someone else had put together but I quickly realised this was not going to be anywhere near detailed enough for what I intended. He had put his spreadsheet together to try and create a chronological reading order of the chapters from the books and it did not contain everything that happened, only the major events needed to loosely stitch the order of events together. So I began work on a spreadsheet of my own that would list every event, no matter how large or small, and also track every journey and every piece of news sent by raven, ship or messenger. This has become a huge and extremely complex project in it's own right. The spreadsheet is now over 2mb in size with separate sheets for each year of the main story plus eight sections of history and back story. The shortest sheet of the main story is 422 lines long with the longest at 2185 lines of data. The history sheets average around 250 lines of details. Lining everything up and making sure every detail fits together with calculated journey times based on map measurements and data taken from the books has been very time consuming and laborious, but I believe I have now completed that process and can track everyone's movements day by day. The next step is to fully write up the events and finish cleaning up some of the section that is still in a rough form. Once that is complete I will finally be able to return to the original goal of working on the Animated Timeline Map. But technology has not stood still over the last five years while I have been working on the spreadsheet (I should explain that running TitanCon has also taken up a huge amount of my time during this period) and so what began as a Flash project is going to migrate into an HTML5 project. I am particularly keen to see what Adobe Edge Animate and other HTML5 Canvas tools are capable of. Please see the Animated Timeline Map page on my website for more details. Section F contains my proof of concept with the tracking animation for Eddard Stark. Section C contains some work I began on one of the sections of history that shows how the events would appear on screen and also includes some animations I created for tourney events and a fun little animation to demonstrate the destruction of two houses with their House Shields collapsing and being swept away off screen by a broom. The map of Westeros (the continent to the West of the map) was originally created by Tear (username on the Cartographer's Guild website). He kindly gave me permission to adapt the artwork for use in my Animated Timeline Map project. One of the things I noticed was that Tear's map of Westeros was not entirely consistent with the descriptions from the books, some locations ommitted, some not quite in the right place and a few places where the geography of the terrain did not match. I made corrections to the original using Fireworks, sourcing patches from the original artwork to cover up the inconsistences and adding updated content. The patchwork edges are rounded to hide their visibility. I took this idea a step further by removing all of the labels and icons from the original map so that I could replace them with content layers that could be switched on or off by the viewer. Please see the online version of the map to see this in action. 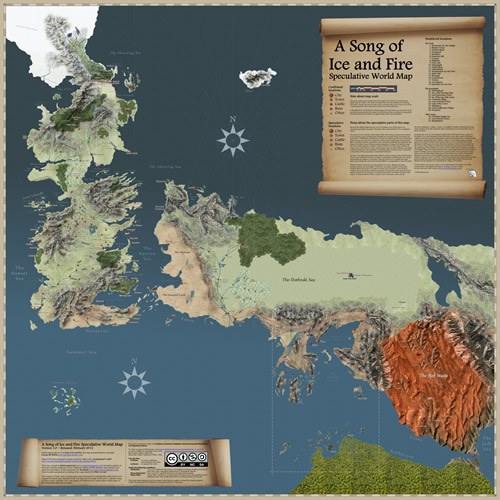 The content of Essos (the continent to the East) is based upon two separate sections of map taken from the books, which have been connected and extended to include regions that characters have visited in the books. Much of the artwork used to create the geography of Essos is taken from Tear's original, but I have sourced a number of images taken from Google Earth to make up new regions, specifically the Red Wastes which is in fact a satellite photo of a region of Arizona. Shortly after I completed work on this project George RR Martin released an official map that fully charts Essos. My intention is to revisit this project and redraw my map with the correct coastlines and place markings, but in the art style of Tear's original that I adapted because many people really love the art style. In fact I quite often receive email from fans telling me they prefer it to the official maps despite it not being 100% accurate. I released my map under a Creative Commons licence and it has been adapated for many other projects, including by IGN (the biggest gaming news website in the world) as the basis for their Game of Thrones Wiki map. Before I started work on the animated timeline map project using Flash I was exploring the possibility of using Google Earth to do the same thing. I created a map that replaces the standard Earth map with a blank blue map onto which I placed the map of Westeros created by Tear and I also added the map of Slavers' Bay in roughly the location where it would be in relation to Westeros. Users can download the map data and import it into Google Earth to view the map. I realised that Google Earth was not going to be capable of the timeline effects and animations that I wanted to use and so I decided not to continue with this project, but it is still a pretty cool way to view the world of Westeros. Please see the Google Earth page on my website for more details. In 2011 there was an update to the forum design of westeros.org (the George RR Martin fan forum) which removed skins, mainly so that the organisers only had to work with one stylesheet. Up until this point there had been a number of colour schemes available including white background with black text, or a black background with white and red text. Many forum users strongly preferred viewing the forum with one of those skins and so I created some CSS stylesheets to recreate them for the new forum design that other people could implement using the Stylish plug-in. Please see the skins page on my website for details about the skins, including side by side screenshot comparison and an instruction document I wrote on how to install the skins.